What are you doing for Mardi Gras weekend? Anyone headed to a parade? Whether your screaming "Throw me something, mister" at a parade or celebrating with the neighborhood children here is a cute Mardi Gras crown to wear. 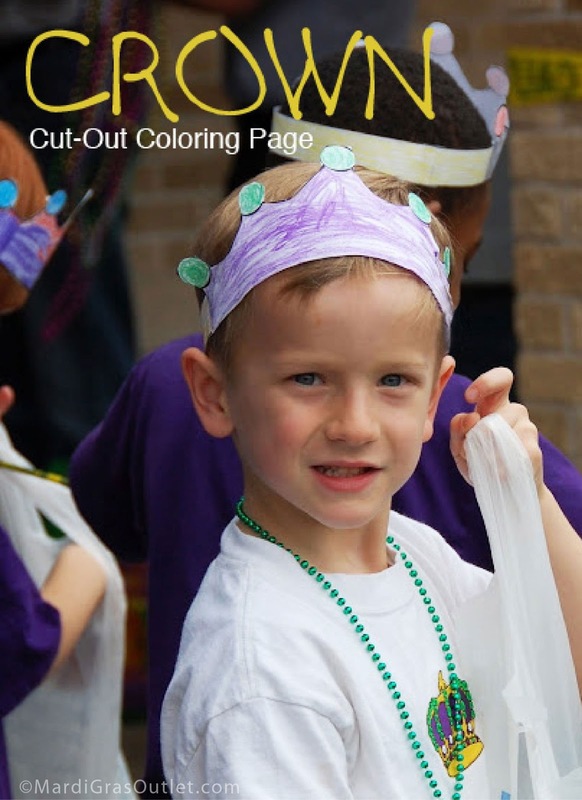 This simple color and cut- out crown is the crowning touch (pun intended;) for Mardi Gras. Everyone loves to be KING for a DAY! Print out this paper crown on 8.5" by 11" card stock or regular paper. Decorate the crown with paint, crayons, beads or glitter to complete your custom crown. This is a great class or family craft project. You will need a PDF reader in order to view the page. Click here to download a free PDF reader. 1. Color and decorate your crown. Add glitter, stickers or faux jewels. Get creative! 2. Follow the lines to cut out the crown and the two head bands. 3. Attach the headbands to each side of the crown with tape, glue or staples. 4. Fit the crown to you head and attach the bands together at the back (as shown in the photo above). Happy Mardi Gras! Let the revelry begin.